Young midfielder Alex Mowatt was the goal hero again as Leeds United moved closer to safety in the Sky Bet Championship with a 1-0 win at Wigan Athletic. Mowatt scored the only goal of the game early in the second half with another of his special strikes to take his tally up to eight this season. United then held on for the remainder of the game to collect three points that take them 16 clear of the bottom three with 10 matches left. 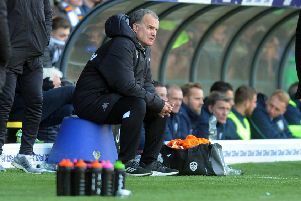 The team showed two changes from the one that beat Ipswich in midweek with Gaetano Berardi in for Liam Cooper at left-back and Steve Morison back up front with Sam Byram injured and a change of formation made to a 4-4-2. Leeds started well enough as Sol Bamba’s header from a Luke Murphy corner was saved by former United keeper Scott Carson. Morison and Mowatt hit efforts wide and Charlie Taylor, playing in midfield again, shot wide from distance. Wigan finally put a worthwhile attack together with Bamba deflecting Kim Bo-Kyung’s shot wide, but it the Whites were still edging it and Mowatt found Morison unmarked in the box only for the forward who has not scored this season to hit his volley well over. Berardi had a shot from distance saved by Carson while Marc-Antoine Fortune went close for the hosts, but the first half ended goalless. Wigan improved at the start of the second half with Don Cowie having a shot blocked by Giuseppe Bellusci and Silvestri saving from James McClean. But in was Leeds who did find the net when Morison found Mowatt and he beat Carson with a terrific shot from the edge of the box. Wigan looked to hit back, but the united defence held firm and when they were beaten Silvestri was able to save to deny the lively McClean. Taylor did shoot over the bar as Leeds briefly relieved the pressure. The hosts were soon back on attack, however, with McClean hitting a shot into the side netting. Sheyi Ojo went close with a low shot and James Perch sent a header onto the roof of the net, but Leeds survived and were grateful to keeper Silvestri again in added time as he acrobatically kept out McClean’s free-kick. The resulting corner was headed over by Harry Maguire and United were home and dry for a battling win and another valuable three points that lifted them up to 13th in the table. Wigan: Carson, Maguire, Boyce (Kvist 67), Perch, Pearce, Bong, Pennant (Cowie 45), Kim, Ojo, McClean, Fortune (McKay 78). Leeds: Silvestri, Wootton, Bellusci, Bamba, Berardi, Cook, Murphy, Mowatt, C Taylor, Morison (Cani 87), Sharp (Antenucci 87).